Jack served in VA-25 aboard the USS Midway CVA-41 from 1959 through 1962. 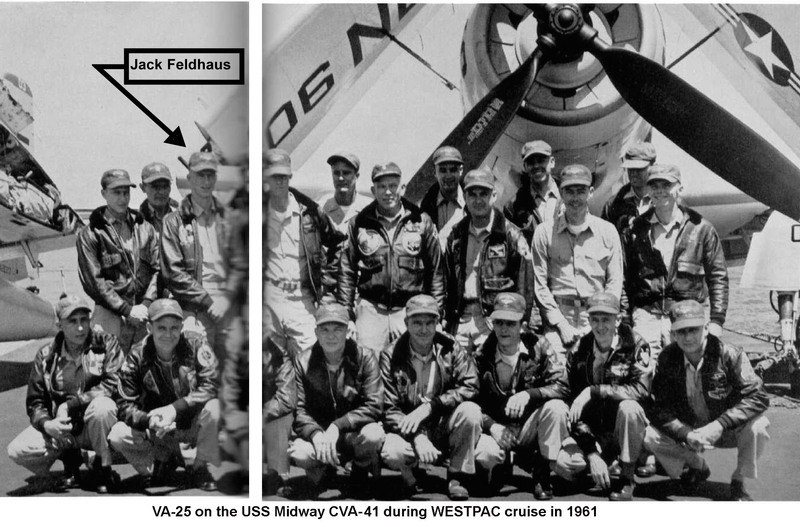 He made two Westpac cruises aboard the USS Midway, one in 1961 and one in 1962 . Just before the Vietnam War, VA-25 learned we would be giving our SPADs to the South Vietnamese at the end of the cruise. This required that each aircraft go through the Atsugi (Japan) Overhaul facility for some minor changes to the communications system. Two by two, the planes cycled through Atsugi. I was scheduled to lead a section (two aircraft) to Atsugi, and then pick up two aircraft that had already completed the installation. We launched from the ship in clear weather and flew for some time over water. We finally crossed the Japanese coastline about 80 miles south of Atsugi and promptly became engulfed in broken clouds. We were flying above all the local mountains, except Mount Fuji. About 50 miles out, I contacted Atsugi Approach Control. They located us on radar and cleared us to descend in preparation for landing. At about 8,000 feet, we broke out into a small hole in the clouds. I could see the ground straight down, but only clouds ahead. I cannot explain what happened or why. Up to this point every thing had gone like a textbook instrument approach. For some unexplained reason I got a very uncomfortable feeling. Sweaty palms, perspiration, and an upset stomach. I looked over at my wingman, JACK FELDHAUS, but he didn't seem bothered by anything. Anyway, I decided to make a descending 360º turn. We completed the turn as we broke out below the clouds. There were still mountains between us and Atsugi. On our previous course, we would have probably collided with the mountains while still in the clouds. I've always harbored a deep distrust for ground control instructions since a night flight from MIDWAY in 1953. The vector took me towards the Black Sea. I had flown outside of communications range before anyone in CIC noticed. My controller had gone out for coffee or something. His voice sounded a little panicky after I turned around and flew back into communications range. Anyway, Jack and I zigged and zagged our way through a mountain pass and landed safely at Atsugi. We picked up the other two aircraft the next day and had an uneventful flight back to the ship. Jack probably never realized how close we came to having permanent wings. It made very little difference to the aircraft. They were probably trashed by the South Vietnamese within a year. Jack did get a couple more years before he was killed 8 October 1966 while flying with VA-152 in Vietnam. Feb/March MIDWAY participating in a world-wide operation called DICE CUP. 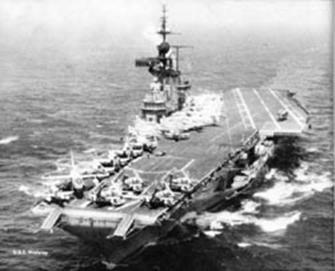 12 March A few hours after termination of DICECUP MIDWAY was relieved on station by USS RANGER (CVA-61) and MIDWAY returned to Alameda. 18 March CDR EDWARD B. HOLLEY Jr. relieved CDR J. R. BOWEN as CAG-2. 3 April CDR John W. FAIRBANKS relieved E. V. IZAC, Jr. as commanding officer. Without delay, the Air Group began an intensive turn around training program in order to be ready for the next deployment. 1 July VA-65 was redesignated ATKRON TWENTY-FIVE (VA-25), conforming to the Air Group TWO squadron numbering sequence. 15 August After five short months at NAS Alameda, including one three-week Fallon deployment, VA-25 again loaded her planes, personnel and gear aboard MIDWAY for the squadron’s eighth deployment in WESTPAC. September Two weeks in Hawaii included a successful OPTA (Operational Training) and more liberty than could be afforded. MIDWAY sailed for Guam and the Philippines while the Laos crisis was prominent in the news and kept all hands on their toes. However, this crisis soon subsided and MIDWAY enjoyed such ports as Yokosuka and Buckner Bay. November As a result of a serious fire onboard MIDWAY while at Subic Bay, she was ordered back to Yokosuka for repairs and VA-25 conducted flight operations from NAS Atsugi, Japan. After two-weeks in the yard, MIDWAY operated off the coast of Japan before proceeding to celebrate Christmas in Kobe, Japan. 2 January MIDWAY was back at sea, before returning again to Yokosuka, Japan for ten days. VA-25 off-loaded and flew out of NAS Atsugi for the third and last time this cruise. 13 January The Air Group flew aboard MIDWAY as she sailed for Okinawa and a month of intensive air operations. February After a five-day visit to Sasebo, Japan, Midway participated in Operation BLUE SKY, an exercise with the Chinese Nationalist Air Force, during which VA-25 flew many simulated strikes against Taiwan. During this period the 1,000th landing by VA-25 for this cruise was made by Commander FAIRBANKS. 13 February France tested a nuclear device. 19 February MIDWAY visited Hong Kong. After a week of trying to buy out Hong Kong, the ship got underway for a last look at Yokosuka. 3 March LTJG A.D. WILSON made the last landing of the deployment. The squadron had flown a total of 4,047.4 hours with 1,132 landings since leaving CONUS. All but one of VA-25 pilots became members of the MIDWAY Centurion Club. 10 March After a five day stay in Yokosuka, Japan, MIDWAY got underway for CONUS with a short two-day stop in Pearl Harbor. 23 March VA-25 flew ashore, conducting simulated offensive training strikes against CONUS with the USAF defending. Two days later MIDWAY sailed under the Golden Gate and VA-25 off-loaded at NAS Alameda for a welcome eleven-month training cycle. 8 April CDR ROBERT B. SELMER relieved CDR E. B. HOLLY Jr. as CAG-2. June Deployed to NAAS Fallon for conventional bombing and close air support training. July The Joint Strategic Planning Staff (JSTPS) was formed at Offutt AFB outside of Omaha, Nebraska. This joint-services staff prepared the first Single Integrated Operation Plan (SIOP) the following spring, which included carrier-based aircraft. 29 August After a one-week deployment aboard USS LEXINGTON (CVA-16), VA-25 flew aboard KEARSARGE to complete night carrier qualifications and build-ups. All pilots qualified in one day. September Deployed to NAAS Fallon for conventional bombing and close air support training. Oct/Nov Deployed to NAF China Lake for three weeks practicing low angle loft and lay down delivery methods. December The squadron conducted operations with MIDWAY off the California coast. 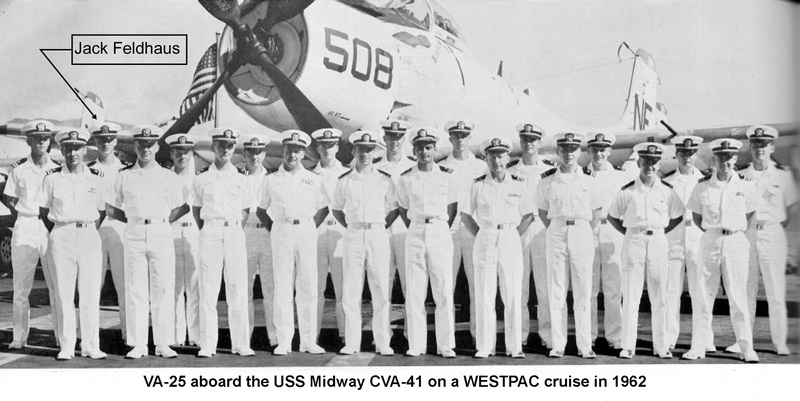 16 February MIDWAY with CVG-2 embarked, departed Alameda for the squadron’s ninth WESTPAC deployment. 23 February COMFAIRHAWAII conducted an ORI and NORM for MIDWAY and her Air Group. VA-25 came through with a tentative score of 91.00, the second best score achieved by an AD squadron in the Pacific. 24 February LCDR J. "L" BRADY made the 89,000 landing aboard MIDWAY. March A Marine F8U squadron embarked in MIDWAY at Subic Bay and operated in the South China Sea through the end of the month. 23 March MIDWAY departed Hong Kong after three of a scheduled seven-day visit to stand alert during the Laotian crisis. April/June MIDWAY visited Kobe, Iwakuni, Sasebo and Yokosuka. Over sixty percent of the at sea time between visits was spent conducting routine training including participation in Operation BIG SHOT. 1 May CDR ALAN B. SHEPPARD, Jr. splashed down in the Atlantic off Florida after a 115-mile suborbital flight. The Freedom Seven capsule was recovered by USS LAKE CHAMPLAIN (CVS-39). LT J. F. FRANCIS made the 91,000 landing aboard MIDWAY. 26 May LT D. L. CLARKE making the 92,000 landing aboard MIDWAY. 19 July LT J. E. JONES became the sixth member of MIDWAY’s exclusive Double Centurion Club. 7 August LTJG A. D. WILSON became the seventh member of MIDWAY’s Double Centurion Club. 4 September LCDR J. "L" BRADY became the eighth member of MIDWAY’s Double Centurion Club. LCDR BRADY also had the distinction of making his second 1,000th landing, the 94,000th on MIDWAY. 28 September MIDWAY and VA-25 safely returned to Alameda. The squadron logged a total of 3,641 flight hours during this seven-month deployment. This was done with a minimum of shore basing involved. VA-25 changed homeport to NAS Moffett Field. Our SPADs looked like small model airplanes inside the huge airship hangar. 6/15 November During a MIDWAY carqual period, LT D. L. CLARKE became the eleventh double centurion aboard MIDWAY. During this same period LCDR H. F. GRIFFITH, made the 96,000th landing aboard MIDWAY. 30 October The Soviet Union detonated a 50-megaton thermo-nuclear weapon. 26 November VA-25 moved into the cold climate of NAAS Fallon, Nevada for three weeks of weapons training. This was the first cold weather operations for many pilots but All Hands "turned to" and made it a successful deployment. The first week was limited to perfecting our low angle loft capabilities and curing some cases of "SWITCHITIS". The second week found us practicing glide bombing runs and strafing. The third and final week was spent COMPEXING with VA-165 observing and grading. December LT L. D. HUGHES crash landed his crippled aircraft. The landing was so well executed, thus reducing damage, that it was classified as an incident. 15 December VA-25 returned to NAS Moffett Field with 28 E's which proved their excellence in ordnance delivery. 20 December CDR BILLY D. HOLDER relieved CDR R. J. SELMER as CAG-2. This is the year that everything in naval aviation changed. The AD-6/7 became the A-1H/J, but it was still the SPAD. 1 February VA-25 was back aboard MIDWAY for group ops. This cruise was uneventful as well as short. 7 February VA-25 returned to NAS Moffett with another MIDWAY Centurion - LT G. M. GALES. 22 February VA-25 received its annual Administrative/Material Inspection by COMFAIRALAMEDA. 22 February VA-25 once again called MIDWAY home, participating in a WEPTRAEX. 24 February LTJG T. W. RANDALL experienced complete engine failure at 18,500 feet. After trying to restart the engine, LTJG RANDALL bailed out at 9,500 feet and was picked up by helo about five minutes later. 27 February LCDR H. F. GRIFFITH and LT G. T. McGRUTHER made their 100th landings aboard MIDWAY. 28 February LTJG T. W. RANDALL, back from NAAS Fallon, made his 100th landing aboard MIDWAY. 1 March LT. L. D. HUGHES made his 100th landing aboard MIDWAY. 2 March VA-25 returned to NAS Moffett. 11 March VA-25 was again embarked in MIDWAY for a STRIKEX exercise named "POT SHOT". The squadron's intensive training paid dividends and all went smoothly. 23 March VA-25 returned to NAS Moffett for preparations for deployment. During these last fourteen days, the A-20-R COMPEX was completed and the squadron earned additional E's. 6 April MIDWAY, with VA-25 embarked, sailed westward under the Golden Gate for the squadron’s tenth deployment to the Western Pacific. 16 April MIDWAY and CVG-2 underwent an Operational Readiness Inspection (ORI) at Pearl Harbor. May/June MIDWAY visited Yokosuka, Sasebo, Hong Kong, and Subic Bay. May Lt Bruce M. WOODWORTH became a MIDWAY Centurion. 4/7 June MIDWAY conducted exercise COUNTERTHRUST. The squadron logged an impressive 1,031 hours from the deck of MIDWAY during the month of June. July CDR BRADFORD became a Centurion and also made the 102,000th landing aboard MIDWAY. 9 October With the cruise nearing completion, MIDWAY visited Beppu and Yokosuka before departing for CONUS. 20 October VA-25 returned to Moffett Field. 21 October President Kennedy announced a quarantine of Cuba, with 483 ships stationed 500 miles northeast of Cuba put the quarantine into effect in just three days. After 26 days, Soviet Premier Nikita Khrushchev ‘blinked’ and removed the missiles. WW-III was averted again. December CDR H. SPENCER MATHEWS Jr. relieved CDR Billy D. HOLDER as CAG-2.